It's a sad fact that when an 8870 is removed, the animals in charge usually just cut through all the cables. I've seen keyboard cables cut because they couldn't figure out how to removed a SAS connector - it ain't rocket science. Anyway, I'll list here all the information I can find and figure-out on cables so that hopefully you can assemble or repair the ones you will need. In most of the larger installations (where there was physical room to have the master port near the computer), this cable would be used. This cable allows the VDU to switch on the host system and can be used with either a V24 or IHSS (no remote switch on in IHSS mode) connection. You can't switch the host off remotely. You either use the proper SHUTDOWN command, hit the CPU re-set switch (making sure the PSU switch is in NORMAL) or switch the PSU to OFF. This cable is used to connect peripherals to the VDUs (and probably for connecting any other SAS device to a host). 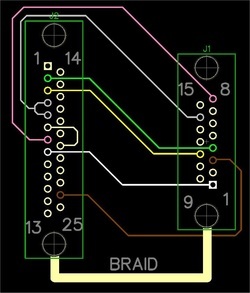 It's a straight though connection so pins at each end are simply connected pin to pin. The cable was capable of supplying power to the peripheral, depending on it's needs so two of the conductors (Yellow and Green) have a much larger current rating that the other three cores. The inner shells are connected together via the heavy cable braid. When testing for continuity using a meter, note that the out housing (the spring loaded part) seems to be electrically isolated from the metal shield around the pins. The SAS connectors seem prone to corrosion on the pins. A squirt of switch cleaner really helps. Oh, to remove the connector, pull the outer metal housing away from the socket and the plug will just come out. This is the proper way to do it. The crappy way is to take a pair of scissors and just cut the cable. Animals. Used to connect different ADO cables together, so a cable from a DAP (7177-00) to an ALME cable (7408-00) for example. 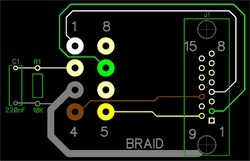 The version of the cable I have has four resistors soldered across the pins at each end. 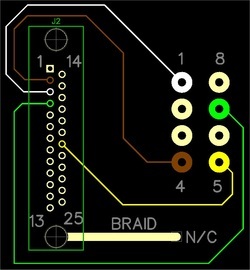 I used to make these cables for use in the office and never used any resistors. I'm guessing you only need these if the cable run is excessive; save greater than 10 meters. 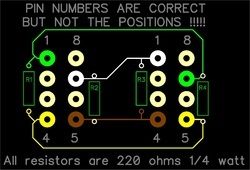 Also note that the pin numbers are correct but the physical positions are backwards. When you open up an ADO socket the pin numbers are clearly printed inside. It has a 25 way IDC female connector on one end for connection to the VDU, and a male ADO plug on the other. It has a 15 way IDC female connector on one end that connects to ALME #1, Channel #1, a male ADO plug on the other. This cable works well with the 7393-02 ADO coupler. 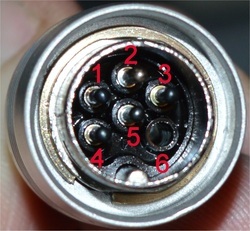 This cable has a 50 way IDC female connector on one end that plugs directly into the front of the PLC2, and then has two cables leaving this connector, each being 1.5 meters long and terminated with a 25 way IDC male connector. The two cables are each labelled either "A" or "B".